Honeywell International, Cognex Corporation, and KION Group are backdoor ways to play the e-commerce and e-fulfillment sector. Investing in the e-commerce sector isn't just about buying e-tailers or software companies. You can also get exposure by buying stock in companies that provide solutions for the retailers and e-tailers building out their e-fulfillment capabilities. This is where warehouse automation comes in: If a company is going to offer e-commerce, it's going to need a warehouse, and a technologically integrated one at that. Here's how you can make money from this hot sector of the economy. 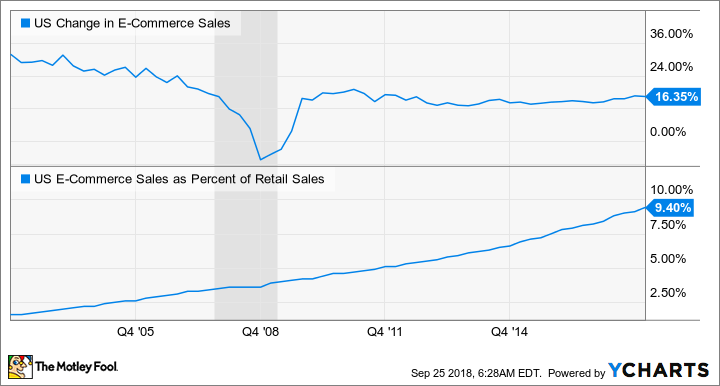 As you can see below, e-commerce sales continue to grow at a mid-teens clip, and are rising as a percentage of retail sales. These trends bode well for companies like diversified industrial Honeywell International (NYSE:HON), machine vision company Cognex Corporation (NASDAQ:CGNX), and -- for those investors willing to look further afield -- Germany's KION Group AG. US Change in E-Commerce Sales data by YCharts. Honeywell is best known for its aerospace segment, and rightly so. But if you look at where the company is raising guidance this year, safety and productivity solutions (SPS) stands out. Even though the segment was only responsible for around 11% of profit from the second quarter, it's actually responsible for 19% of the increase in Honeywell's earnings guidance so far in 2018. The key to the 11% organic revenue growth from SPS in the second quarter was Honeywell Intelligrated, a company that helps businesses with e-fulfillment in their distribution centers and includes customers like Amazon.com. Intelligrated's orders were up a whopping 40% in the second quarter. On the second-quarter earnings call, CEO Darius Adamczyk outlined some of Intelligrated's work for Amazon, including thousands of meters of material-handling equipment including high-speed sorters and conveyors. Adamczyk believes Intelligrated will "turn out to be probably the best acquisition that we've ever done and I continue to feel very strongly about that." Moreover, Adamczyk said the strong growth in orders was "not surprising to us," and added that he is "very bullish about a lot more growth. So you should expect kind of double-digit orders growth in the second half as well." Exciting days ahead. Although Honeywell isn't a pure-play warehouse automation or e-fulfillment stock, its Intelligrated business is a key driver of the increase in guidance for the stock, and therefore a key swing factor in an investment. The company offers investors a way to invest in two hot investing trends with one stock: e-commerce and robotics. Cognex is the world leader in machine vision solutions. Its products are well known to early adopters of automation technology, including the automotive and semiconductor industries, although in recent years it has grown strongly through large deals with consumer electronics companies such as Apple -- its largest single customer. Among the key drivers of the growth of machine vision in factory automation are robotics and the increasing sophistication of automation, driven by the Internet of Things (IoT). Automotive and consumer electronics remain Cognex's key end markets, but its fastest-growing market is logistics, driven by "retail and e-commerce fulfillment," according to CEO Rob Willett. Cognex's logistics sales -- that is, the sales of its machine vision systems to help e-fulfillment centers function better-- make up only 10% of its current sales, but are growing in excess of 50% in 2018, and according to Willett, could continue to grow at 50% over the long term. In other words, a large part of Cognex's growth is going to come from logistics in the coming years. Last but not least, Germany's KION Group (NASDAQOTH:KIGRY) is worthy of consideration. The company is best known for its industrial trucks (forklifts and warehouse equipment), and describes itself as the market leader in Europe. However, in June 2016 -- just 10 days before Honeywell signed an agreement to buy Intelligrated -- KION announced it was buying Intelligrated's rival Dematic, which provides warehouse automation and controls solutions. KION boasts the leading position in North America in supply chain solutions, and the No. 3 position in Europe. You can see the impact on KION's growth rate in the chart below, which shows two months' worth of revenue and earnings from Dematic in 2016. Dematic now comprises KION's supply chain solutions, or SCS, segment. Pre-Dematic (2012-2015), KION's compound annual growth rate was just 3.7%, and the company's EBIT (earnings before interest and taxes) margin was struggling to expand. However, Dematic has added organic revenue growth to the equation. SCS contributed 22% of total segment EBIT in 2017, and KION management expects industrial trucks and services EBIT to grow in the range of 1.7%-7% in 2018, compared to SCS EBIT growth in the range of 0%-19%. Data source: KION Group presentations. *Contains two months of Dematic acquisition. That said, it hasn't been a great 2018 for KION, with a combination of currency headwinds and production inefficiencies putting pressure on revenue growth (up 1.9% on a reported basis in the first half of the year, but 5.9% when adjusting for currency) and adjusted EBIT margin (down to 8.9% from 9.5% in the first half of 2017). However, if these issues prove temporary and KION starts to benefit from the 11.9% growth in orders in the first half (3.5% for industrial trucks and services and 39% for SCS -- a figure similar to Intelligrated's in the second quarter) then 2019 could see strong growth. Based on the low end of management forecasts, KION trades at a 2018 enterprise value-to-EBIT ratio of 13 times, and 15.4 times free cash flow. That's an attractive valuation for a company with good long-term prospects from warehouse automation.